Very rarely do I find an author whose work I look forward to time after time — whose work I literally throw my phone while screaming upon the announcement of their next book. But I am constantly amazed at the work of A.S. King. If you've ever asked me for a book recommendation, the first one I'll suggest is Ask the Passengers. So you can imagine my excitement when I stumbled on her blog last year and discovered that her new book would be out in 2019. I had a brief Twitter freakout and have been counting down to this day for months. And the newest novel didn't disappoint. Dig follows a string of characters as they navigate their lives in a suburb outside of Philadelphia. There's something that each character is doing because of their parents. Marla has a secret that she can't share with her kids because they'll know that's why they turned out so strange. Loretta lives by the script she knows she should be playing out because her dad has a temper and her mother won't do anything. CanIHelpYou? sells drugs in the Arby's drive-thru to get away from her racist mother. The Shoveler is tired of moving because his mom can't hold down a job. Malcolm, Gottfried, Jake Marks. They've all been visited by The Freak and she knows what each of them needs. But how? And how do each of the stories intertwine? I was lucky enough to dig (see what I did there?) through A.S. King's brain to see what she had to say about her newest book. Dig is finally out! How does it feel? This book has always felt a bit like I was walking upstream with three full barrels of dirt tied to my waist. So it feels good to finally release it. Maybe that means I can also untie the barrels now. What was the writing process like for this one? It was fun and frustrating, exciting and excruciating, just like all other books. But longer. With barrels tied to my waist, walking upstream. I write by the seat of my pants, so the speed and ease of a book’s writing process depends solely on how willing my characters are to cooperate. These characters weren’t so bad, but they were slow. Nearly four years slow. They did cooperate eventually... though The Freak didn’t tell me her secrets until page 350, so that was a bit cheeky of her. But mostly it was fun. And sometimes scary. 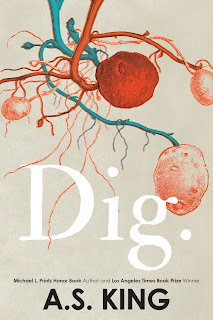 Let’s talk potatoes as some might be terrifically perplexed by their place on the cover before picking up Dig. Were they the catalyst for the story or did they simply keep coming up? Potatoes just showed up. Over and over again, potatoes kept showing up. Then the former farm showed up, then the university showed up. It’s not that simple though. Again, I follow the characters. So once the spuds showed up a few times, I did what anyone would do: I Googled potatoes and potato recipes. They kept showing up, so I read non-fiction and researched more. (I am lucky to have a pretty extensive potato-growing past, so I know the feel and the smell of potato plants and their horticultural details very well. That helped.) So the spud fascination fed itself. It showed up, then it made me want to know more. This is pretty much my process. I’ve said this to you before, but magical realism is one of my favorite aspects of your writing. But it wasn’t until Dig that it dawned on me how you’re using magical realism in terms of mental health. Astrid is struggling with her sexuality and sends messages to the sky. China has turned herself inside out from PTSD. Vera is seeing her best friend in different scenarios through her haze of grief. Gerald dreams in a different world to escape reality. In Dig, The Freak flickers to new places. Would you say a lot of your work is about the struggles of mental health? My not-quite-realism/surrealism is certainty all about metaphors. And yes, I use it to connect with the real lives of my readers. That could mean something as serious as mental illness, or as mild as just feeling normal emotions most of the time. That said, The Freak isn’t a great example in this book of someone suffering from mental illness. I’d say the Shoveler probably is. Or Marla. Or Missy and Loretta. But yes, dealing with mental illness is surreal so I feel surrealism lends itself to the stories that my characters tell me. As for the last question, yes, I’d say my stories are often about people who are struggling, period. Who doesn’t struggle? Sometimes my characters have diagnosable mental issues, sometimes not. But yes, the mental health of human beings has been something I have been interested in for my whole life. Not just because I have dealt with it directly, but because I know too many people who don’t “believe” in teenage mental illness, which leaves struggling teens at a disadvantage to face their issues with the help of professionals or even within their families. My goal is to crack/break/destroy the stigma, open the conversation, and finally get to a place where people can see what’s really going on. Some people don’t respond well to real-talk, so surrealism helps me sew it into their brains through a loophole. Something else I’ve always immensely enjoyed, and why I think your work stands out to me, is the intense reality of it all. YA is often centered around typical teenage problems. But yours get down to the dirty parts of life — the parts not everyone always wants to explore. Why do you think that that makes you, or someone like Andrew Smith, stand out? I’m not even sure if I do stand out. I write real because I am real. I know this is probably why Smith and I are great friends. It’s easy to talk to him because we speak the same real-language. Same with many of my writer friends who stand out. I have spent a lot of time in my life surrounded by people who were not living in the real world. People who lie to themselves. People who pretend everything is fine. People who can never be wrong or who make up stories to keep themselves superior. These are adults, mind you. Teenagers? I find them to be a lot more real than adults for the most part. And writers who have that same respect for teenagers, then, stand out to me. Look, life is dirty. If we don’t start looking at the dirt, we... oh. We’re probably already there. That’s why I write about intense reality — because life is intense reality. Ask any kid who had to cower against a wall in their classroom today during a drill, or the real thing. Life is intense reality. The formatting of this book is interesting. Was that intentional or did it just happen organically? The formatting of the Shoveler’s and Marla’s internal rants probably made me the enemy of all typesetters everywhere. I knew it would. But that’s how his thought tunnels look. It’s a visual metaphor. And it was totally intentional. But you could mean the structure — if so, yes, it was weird, wasn’t it? The blender. The strainer. I really have no idea where those came from. It just happened. So, I’ll claim: organic with revision intension. Your characters are all so very different, but they all exist within the same place. Their stories don’t always intertwine in a big way, but they’re still aware of each other. Is that a reflection of how we’re absorbed in our own problems and don’t see the problems others are facing or am I simply reading too much into this? I’m not sure. I mean, I don’t try to do anything in my books, so what happens is organic. And maybe organic things reflect reality. And if that’s true, then yeah, maybe this is true. So you aren’t reading too much into anything. You are educating me about my own book. Thank you. It fits the theme, all right. But on this topic, I think it’s important to note that the book is about generational differences and, most importantly, the withholding and confusion of familial love and how that affects people in different generations. A lot of people don’t have the ability to love without conditions or without a sort of emotional blackmail. I’m no psychologist, but I’d say the family we read about in Dig is riddled with more approachable issues like anxiety and depression, but also more surreptitious issues like narcissism and sociopathy. A lot of what happens to us as kids is what shapes the rest of our lives. Malcolm is lost because of his mother and father dying. Marla’s children are cold, distant, and a little unhinged because she was distant. The Freak had a tumultuous upbringing. What is it that drew you to these stories? Oh, Megan, I know I’m a frustrating interviewee. I really do. What drew me to the stories were the characters who showed up and started talking to me. They started telling me stuff and I started writing. I know that sounds like my brain is made of granola, but that’s really how I write books. I’m the last to know what the hell is going on. So choices, then, are unlikely. So I’d written the short Marla/Gottfried (note: this is the first mention of potatoes on page two —my brain is messed up!) and Marks brothers chapters first, then I wrote the Shoveler. For maybe eighty pages. He just kept shoveling and he wasn’t telling me much at all. The Freak showed up but she was a mystery (remember: she didn’t tell me squat for 350 pages) and I decided to toss the book. Bye, book! You’re fired! I started writing another book about a girl named CanIHelpYou? and her job at Arby’s. After a few chapters, she and her friend hang out at the park one night and suddenly, there’s a kid with a snow shovel in the park — but there’s no snow. I thought: OH WOW. IT’S AN A.S. KING NOVEL. I dug out the Shoveler and The Freak, Malcolm showed up, and then I eventually figured out how they all fit together. Technically, that’s what drew me to these stories. Curiosity. Excitement. And pure weirdness. And trust. I trust the process. I try not to stress when I toss 80 pages of what seemed like a good thing. They will usually wander back. But not without trust. Okay, let’s change gears. 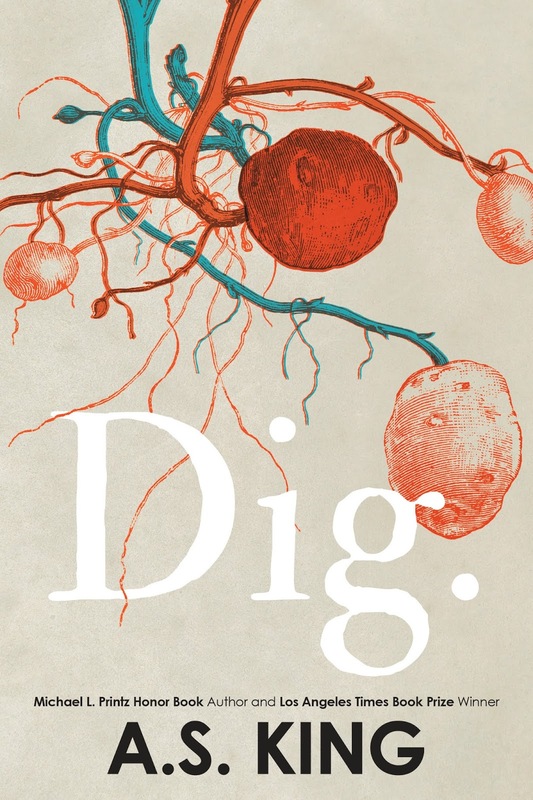 What do you hope readers gain from Dig? As always, I hope readers get what they need from the book. Have the characters from a future novel introduced themselves to you yet? If so, what can you tell us? YES, THEY HAVE! And I can tell you nothing. Not yet. Sorry. But in the meantime, I do have a middle-grade novel coming out in October (The Year We Fell From Space) and I can tell you that it’s about stars, depression, and a meteorite. I’m reading poems, mostly. All kinds of poems. So many poems. What’s the best advice you’ve gotten lately? Breathe. 🡨 best advice ever. And most importantly, what's your favorite potato dish? Mashed, with proper homemade gravy. I want to thank A.S. King so much for letting me getting super deep with her about her latest novel. It was an insightful read that will prove the importance of not only connection, but deep connection — the kind that reminds you that you're okay, that you're safe, and that you have someone to rely on when you need it. It's a book that reminds you to learn from your mistakes and not pass them on from generation to generation. It was, in short, another home-run for one of my favorite authors. Dig is available to buy today! Yes! Ask the Passengers is my go-too recommendation, too!